In the world of tech, slim is the new black, as companies such as Apple and Samsung constantly endeavour to churn out new devices that pack more features into thinner and lighter form factors. This design approach has bled through to many other tech products, including portable hard-drives that boasts more storage within a smaller device footprint. 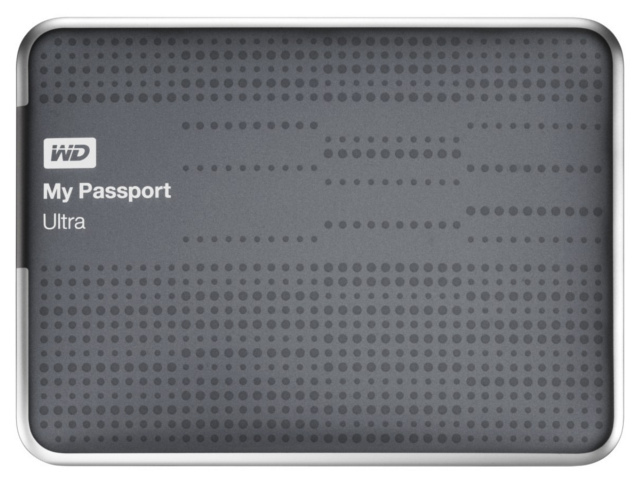 Case in point: WD’s My Passport Ultra. Measuring in at a mere 12.8 mm thin (110 x 81.6 x 12.8 mm) and weighing in at just 160 g, this drive is extremely portable, so much so that it can be slipped into your skinny jeans’ back pocket. At the same time it is also quite stylish thanks to a clean, uncluttered design and reflective dot pattern employed on the HDD’s front top cover. The Ultra is a USB 3.0 capable hard-drive but works fine when connected to a USB 2.0 port as well. Connectivity speeds are around three times quicker when plugged into a Superspeed (USB 3.0) connection though. During our tests the drive delivered transfer speeds of up to 105 MB per second for smaller file sizes, and around 78 MB per second for larger files, with a 185 GB folder being copied to the drive in less than 40 minutes. When connected to a USB 2.0 port the data transfer speeds fell below 30 MB per second, with a full HD Blu-ray quality feature film of 25 GB in size, taking around 15 minutes to copy to the drive. WD’s My Passport Ultra is compatible with Windows as well as Mac OS X, with software for both computer operating systems found on the drive itself. We found the bundled software of the drive to be some of the most comprehensive, easy to use and useful of any drive we have ever received for review. Users get WD Security, which enables you to password protects the My Passport Ultra drive to protect it from unauthorised access. The data is also hardware encrypted, which provides some degree of piece of mind should the device be lost or stolen. WD Drive Utilities is another piece of bundled software that users who love to tinker will appreciate. This software provides you with status reports on your drive, allowing users to run diagnostics on the drive to find out if it is performing at optimal levels. Users can also set certain aspects of its operating including the amount of time it takes for the drive to go into sleep mode. The final piece of the software pie is the less glamorous but highly crucial backup utility by the name of WD SmartWare (device works well with Apple’s built in Time Machine backup software as well). Amongst other features, SmartWare allows one to select the content on a computer which they want to keep backed up and then schedule the frequency and times when the data should be copied to the My Passport Ultra. WD’s My Passport Ultra HDD sports some genuinely handy security software that allows users to keep their sensitive data protected in the event that they lose the drive. It also boasts some useful backup software enabling you to keep your important info backed up, should your PC crash. In addition, this drive is also quite portable plus eye-catching enough to match the design flair of a user’s MacBook or ultrabook. All this comes at a price though, since the Ultra goes for a budget crunching recommended retail price of R2 300. You can get a 500 GB Sony USB 3.0 portable for around R800 less or 500 GB Verbatim USB 3.0 2.5" Store 'n' Go for under R1 000. Stylish and very portable drive. Quick transfer speeds when connected to Superspeed port. Password protection and data encryption software tools. Software for both Windows and Mac. Very expensive for a 500 GB USB 3.0 portable HDD, but not much else. Stylish and very portable drive; quick transfer speeds when connected to Superspeed port; data backup software; password protection and data encryption software tools; and software for both Windows and Mac.